Brand awareness is a growing priority in web marketing. As you work to make your company stand out from the pack as the leader in your space, you need to convey a strong identity through written and visual content. Google has acknowledged its search algorithms reward businesses with recognizable ‘brands.’ And the search giant asserts that any company can become a brand if it provides valuable information to customers through web content. 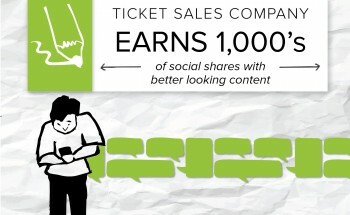 The marketing team wanted to create content that would show its target audience (dance studio owners) that it understands their challenges and can offer valuable solutions to a common pain point – event ticketing. 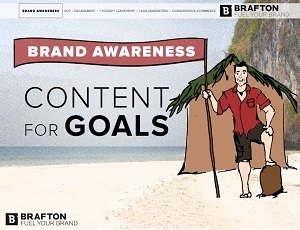 Brafton’s content writers worked with the marketing team to create blog posts that had high social appeal and would build the company’s presence on Facebook. This would increase exposure and drive more traffic back to the company’s website. Knowing that social media users are scanning News Feeds for interesting stories, the strategy took on a decidedly visual focus. Since this client catered to dance companies, appropriate visuals were not hard to come across with costumes, hair and makeup, set design and more. The client’s marketing team agreed with Brafton’s strategists and writers that the best content marketing plan of action would be to cover topics that pair naturally with pictures. We began adding inline pictures to the blog posts that would make eye-catching feature images when shared on Facebook and other social networks. This visual topic was increasing the company’s exposure on social channels and establishing the brand’s identity, but it was also supporting the client’s traffic goals. In addition to posting impressive off-site metrics are, the blog was providing real value to the business’ website. It was a top-two overall traffic driver for the business quarter, and was also second in bringing visitors from social channels to the website. This is a win, because this is where viewers will learn more about the company and what it offers. “One of the best parts about this strategy is that I’ve built a strong relationship with the marketing director at this company. She’s always helping me brainstorm timely topic ideas and providing constructive criticism on articles that don’t quite hit the mark. On the other side of the coin, she lets me know when an article is performing well and expresses her gratitude,” said content writer Camryn Rabideau. There was once a time when businesses could get by without being ‘a brand,’ but those days are over. People are regularly shopping for products and services online, and they want to buy from a company they recognize and trust. By creating a cohesive brand identity through consistent style, voice and visuals, you build a presence that consumers will recognize immediately when they come across it – whether they run into you on social media, in search results or right on your website. To learn more about how to build brand awareness with content marketing, check out our new eBook on Content for Building Brand Awareness.